Huawei may not be the biggest name in the West, but it recently surpassed Apple as the world’s second biggest smartphone manufacturer. Now it’s announcing two new flagships, the Mate 10 and Mate 10 Pro, its first real entry into the bezel-less design trend that’s made 2017 a wonderful year for smartphone design. I had the chance to go hands on with the devices at a small preview event in New York, and there’s a lot to like about both models. Which brings me to an interesting point: the Mate 10 and 10 Pro aren’t your usual pairing of spec configurations. In some ways, it seems they don’t belong in the same series. The basic specs and features are the same. You can read more about them in our announcement post, but both have Huawei’s new designed-for-AI Kirin 970, they both have dual rear cameras, they both come with 4 GB of RAM and 64 GB of storage by default, and they both have huge 4,000 mAh batteries. Oh and they come with IR blasters too, which is surprising but hey, I’ll take it. The Mate 10 comes with a 5.9-inch LCD screen and a QHD+ resolution, while the Pro has an 18:9, OLED display with 2160×1080 resolution. Both devices have tiny bezels, but the Mate 10 has its fingerprint reader on the front (arguably more convenient placement). The Mate 10 has an SD card reader, the Pro does not. The Mate 10 has a headphone jack, the Pro does not. Both models come with 4 GB of RAM, but the Pro can be had with 6GB. The Pro is IP67 water resistant, the regular Mate is not. I don’t know about you, but I as someone who would normally opt for a ‘Pro’ model, the higher resolution, headphone jack, and SD card reader of the regular Mate 10 might make it the more appealing device. Fingrerprint sensor on the front, still a small bezel. But the Pro does feel a little more premium, thanks to smoother edges and a even smaller bezels. The 18:9 aspect ratio also means the device is a little narrower than 16:9 Mate 10, making it significantly easier to hold in one hand. The OLED display on the Pro popped more, while the LCD on the 10 was a little bit sharper, although both are HDR10-compatible. I hate that the Pro has the Huawei logo on the front. On a bezel this small, it just feels obnoxious. Otherwise, both devices use an attractive all-glass design, and I’m a fan of the horizontal stripe on the rear. It’s been a polarizing element in leaks, but I think it looks better in person. That said, I’m disappointed in the move to glass because there’s no functional benefit to it – there’s no wireless charging on board. Huawei says wireless charging is too slow for a 4,000 mAh battery, which is a fair point, but I’d rather they’d stuck with the more durable, and less fingerprint-y metal. On the other hand, Huawei claims its fast charging can give you a “full day of use” in just 20 minutes. The company is making some crazy battery life claims on the whole, such as 20 hours of mixed usage. The Mate 9 already had very good battery life though, so it’s not a stretch to imagine the more efficient processor is helping out. I was only able to use the devices for a few minutes each, but navigating their Oreo-powered UIs seemed perfectly smooth. EMUI is as aesthetically questionable as ever, but after using the Mate 9 for nearly a year, I’ve been impressed with Huawei’s AI-powered optimization. EMUI also has some genuinely useful additions. My favorite feature is a small but clever one: notifications come with a split screen button so you can automatically jump into multi-tasking. It genius, and I can’t believe no ones thought of it before. I also like that, as with the Galaxy S8, the Mate 10 can connect to a display and use a desktop-like UI. Better yet, you only need an HDMI cable not an entire dock. It seemed to run smoothly when demoed to me, although I wasn’t able to try it myself. I did get to play around briefly with the camera and it’s nice to see how Huawei leveraged AI to automatically detect when I was shooting an image of food or other scenes, but as with many aspects of the phones I’ll have to spend more time with the device before I can say whether they’re worth your time and money. So far, Huawei is holding its own in a year full of excellent smartphones. 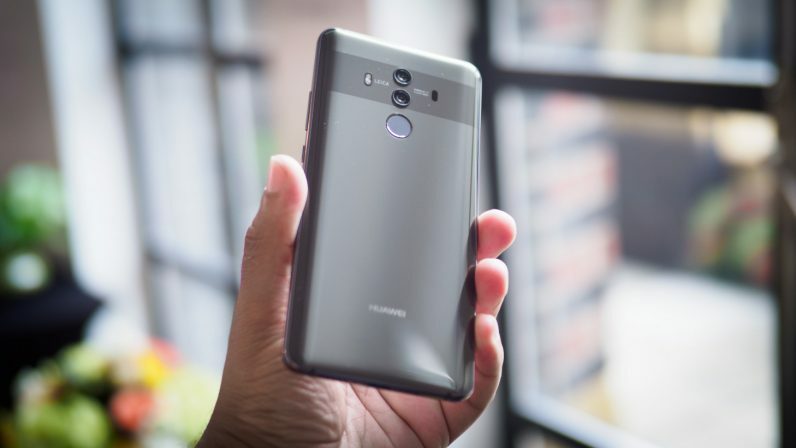 The Mate 10 will cost €699 and the Pro will be €799 when they arrive next month in parts of Europe, Asia, and other markets. US Pricing and availability is set to be announced at a later date.